Vegan What??? : Lentils, who knew? Lentils are considered to be one of the oldest cultivated crops with evidence of their domestication going back 5,000 years. Objects like your camera lens and the lens in your eye are actually shaped like lentils and therefore are named after them, not vice versa. They are mentioned frequently in literature throughout history. Even the infamous Greek gastronome Apicius had several recipes for lentils. They were the food of the rich and poor alike. There are current studies showing that Great Britain experienced a Mini Ice Age; from the 16th to 19th centuries where the climate was too cold for warm-season loving plants like lentils to grow. These findings are even backed up by insect, fish and many public records of the time. In Hungary, traditionally a pork and lentil stew is eaten after midnight on Dec. 31 to ensure financial success in the New Year, both pork and lentils being symbols of prosperity. 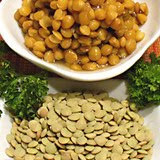 Many cultures consider lentils as poverty food although they were buried in tombs with the pharaohs. The Egyptians even used them as packing material before the invention of those pesky Styrofoam peanuts. Over 100 tons of lentils were used to ship an obelisk from Egypt to Vatican City. Pretty neat, huh? Who knew the lentil was so interesting. Lentils are are a great source of protein, as much as 18g of protein in one cup of boiled lentils (that's amazing!). Cook on low for 6-8 hours, stirring occasionally. The lentils will soak up all the water you add, so depending on how many people you are serving add water accordingly. This is a very hearty recipe and goes along well with corn bread, crackers or tortillas. It's also very inexpensive to make, lentils are about $.79 for a 1 lb bag. Which is why lentils were considered a paupers fare! Do you have any lentil recipes you want to share? I am always looking for new ways to prepare these delectable legumes. Yeah, I'd much rather use lentils for packing peanuts! However, your post has kind of struck some curiosity in me, and I might actually give this recipe a try!